The last time I spoke to Hakainde Hichilema, he was trapped in a panic room in his Lusaka home. Dozens of riot police had stormed the opposition leader’s house in a violent predawn raid, and were now waiting outside to arrest him — or worse. “This guy, [President Edgar] Lungu, wants to kill me,” he said, his voice shaking on the telephone line, as the police tried to flush him and his family out of the panic room with teargas. That was a little over a year ago. Lawyers eventually negotiated safe passage for Hichilema and his family, but he was still slapped with a treason charge. Prosecutors said that he had endangered Lungu’s life by blocking the presidential motorcade at a cultural celebration but most observers agreed that this was simply a pretext by Lungu to crack down on his major political rival. 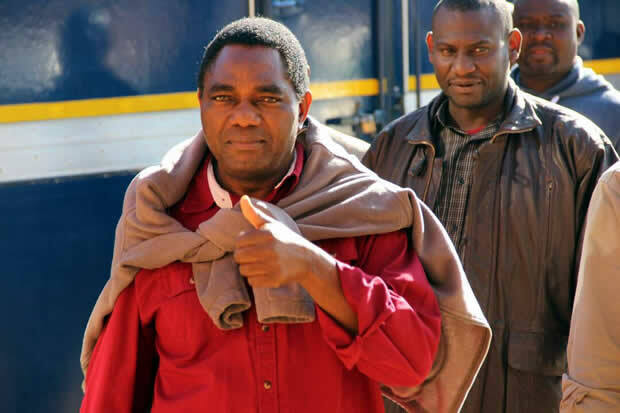 Eventually the charge was dismissed but not before Hichilema had spent 127 days in jail. It was an experience that changed him as a person — and as a politician. “Any normal person has to be changed by that experience,” he said, speaking to the Mail & Guardian at an upmarket hotel in Johannesburg. The scene is a world apart from the filthy, overcrowded Zambian prison cells that he describes. “Our detention centres are death traps … In a room like this, you have 200 inmates spending nights. So you really don’t go to sleep. You take a nap by sitting, and someone has their body inside your legs. There is very poor ventilation — something very simple to fix but it’s not there. Food, there’s no food. And when it’s there, it’s rotten beans, rotten kapenta [sardines]. Medical services are very poor. People go into prison and come out with diseases. During my stay we saw bodies being taken away, dead,” said Hichilema. But at least he learnt something while he was inside. “It’s fortunate that I have been able to be put through this, so when our time in office comes we know which priorities need to be dealt with yesterday.” Needless to say, prison reform is near the top of that list. The 55-year-old was one of Zambia’s richest businessmen and the country’s second-largest cattle rancher before turning his hand to politics. Now he leads the United Party for National Development, which lost the 2016 general election by the slimmest of margins: the party was less than 100 000 votes short out of 3.78-million votes cast. Hichilema disputes the validity of that poll, arguing that Lungu manipulated the result in his favour. He refuses to recognise Lungu’s legitimacy as president, a stance that contributed to his arrest — which, according to Hichilema, was merely the highest-profile incident in a long list of human rights violations committed by Lungu’s administration. Recently, Chishimba Kambwili, a member of Parliament, was arrested on corruption charges, which surfaced only after he defected from the ruling party. Nevers Mumba, the leader of another opposition party, was sentenced to three months in prison after being convicted of lying to a public official, a charge critics say was politically motivated. Earlier this year, the M&G spoke to Pilato, a rapper, who fled into exile in South Africa after receiving death threats from ruling party loyalists after releasing a song that described Lungu as a “rat” whose “main job there is to steal”, a reference to the corruption allegations that have dogged the president. This image is hard to square with Zambia’s hard-won reputation as one of Africa’s most peaceful demo-cracies. But civil society activists contacted by the M&G say Hichilema is not exaggerating, and in its most recent country overview Amnesty International confirmed this bleak picture. Zambia’s economy is also struggling — yet another stick with which critics are beating Lungu. It doesn’t help that, under his administration, the country’s debt has officially quadrupled from about $2-billion to more than $8-billion. Hichilema claims more debt has been hidden, and that the true figure is about $16-billion — about 75% of Zambia’s gross domestic product. Zambia’s political crisis is falling on deaf ears. “There are times I feel like nobody is listening,” said Hichilema, looking tired. And his fleeting visit to South Africa only emphasises this point: at a press briefing that took place just before our interview, only three journalists attended. Aside from the M&G, no South African media house was represented. Hichilema said that international community representatives sympathise with Zambia’s problems but tell him that the situation is not as serious as elsewhere. But he argues that, if left unchecked, Zambia will turn into “another Zimbabwe”, or another Democratic Republic of the Congo. He believes that South Africa, Zambia’s largest trading partner, should play a more active role in the country. So far, South Africa and the Southern African Development Community (SADC) have been entirely silent on Lungu’s abuses. The disaster can be easily averted. Lungu is not immune to regional pressure, and a few firm words from Cyril Ramaphosa, the new president of South Africa and the SADC chair, would go a long way towards ensuring free and fair elections and the protection of basic civil liberties, the opposition leader says. So far, however, Ramaphosa has shown no sign that Zambia is on his foreign policy agenda. No matter how loud Hichilema shouts, few are prepared to listen.